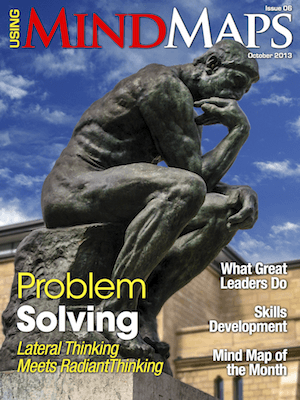 The October 2013 Issue is our Largest Issue to date. I considered leaving some of the content out, but just couldn’t. The main theme this month is on Problem Solving with Mind Maps. The Authors provided some great insight into the topic. The different ideas and opinions are exactly what I am trying to promote in the Magazine. So, if you have an iPad, iPhone, or iPod touch, get your copy now, if you haven’t done so already. Don’t worry, non-Apple fans, I will have something for you soon. Below are some excerpts from the current issue, with links to the Author websites, where you can get lots more tips and techniques on Using Mind Maps. ‘…One of the keys to learning is spaced repetition. i.e. learning something bit by bit over a period of time. Our monthly magazine does exactly that. It provides information on using Mind Maps bit by bit over an extended period. ‘…Problem solving, creative and critical thinking go hand-in-hand helping us to see the world from a number of different vantage points. Each of these ways of thinking strengthen our capacity to think flexibly and intelligently when faced with the unending problems that life throws our way. ‘…Edward de Bono is one of the leading authorities in the field of creative thinking. He also provides tools for lateral thinking. He is also the originator of ‘parallel thinking’ and also developed the ‘Six Thinking Hats‘ as a thinking framework. Paul Foreman provides the Mind Map of the Month, a beautiful hand drawn Mind Map on the Six Thinking Hats. ‘…Exceptional leaders are essential to the success of any organization. They are the Usain Bolt(s) who break records. ‘…The world's most creative people develop better ideas by looking at situations from different perspectives than the rest of us. ‘…The truth is everybody has problems. They’re an inseparable part of life just as atoms are an inseparable part of matter. As you might have probably noticed, some problems seem trivial while others do not. Some are easy to solve, others are more complex. Have you ever wondered why is it so? Have you ever pondered why some people look like they have no problems at all while others are overwhelmed with them?